Chances are, it’s not just the perfect leads that win your go-to films their place in your heart — it’s their pals and sidekicks as well. The wise-cracking best friend or fellow chorine, cranky boss, sympathetic bartender, confirmed spinster secretary, intrepid cop, jealous girlfriend, second-in-command racketeer or bomber pilot, workaholic director…faces familiar from their appearances in many films over the years, their names — not so much. To take a couple obvious examples, what would Casablanca be without Dooley Wilson, Sydney Greenstreet, Peter Lorre, Conrad Veidt, S.Z. “Cuddles” Sakall, Madeleine LeBeau, John Qualen, and Leonid Kinskey? How about My Man Godfrey without Alice Brady, Eugene Pallette, Gail Patrick, Jean Dixon, Alan Mowbray, and Mischa Auer? Probably pretty good films, but just not the same, not as lovable, not as classic. Thus the objective of the What A Character! 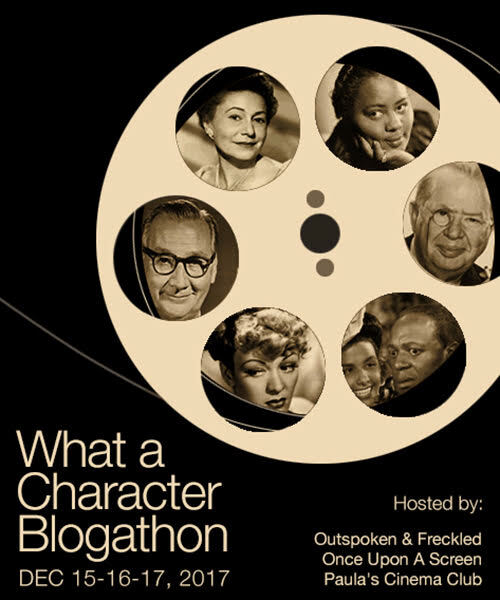 Blogathon has always been to shed the spotlight on these lesser-known but equally talented thespians, whose names usually appeared below the title, but who always elevated any kind of material from Oscar-winning to the most tired, often without saying a word. Please join me here at Paula’s Cinema Club, Aurora at Once Upon A Screen, and Kellee at Outspoken and Freckled for the SIXTH year in a row of paying tribute to the versatility and depth of supporting players. If a salute to lesser-known but essential Hollywood thespians is right up your movie alley, please review the guidelines below, then leave a comment below. Don’t take it for granted we know exactly who you are or where your blog resides – please include the title and URL of your blog, also your Twitter handle if you have one, in your comment below. We will not accept repeats (previously published posts) or duplicate choices since there are so many greats worthy of attention, but your choices are not limited to classics. You can choose any character actor from any era and from the medium of television, which has featured talented regulars since the beginning, and continues to do so. Publish your WAC! post for either December 15, 16, or 17, 2017. Let us know if you have a date preference; otherwise, we’ll split publicizing duties equally among the three days. Please include the WAC! 2017 event banner included in this post on your blog to help us promote the event. Please also include the banner in your own What A Character! post. Thanks to our friends at TCM for letting us borrow the phrase What A Character! Wide Screen World – Alan Hale, Sr.
Posted on 2 November 2017 12 December 2017 by PaulaPosted in Cinema SnacksTagged 2017, blog events, blogathon, character actors, classic movies, wac 2017, what a character, what a character 2017. This is always such fun– I’ll be looking forward to finding out more about another batch of great character actors! Whee! I can’t wait for this one. It’s always a great blogging event. Me either really 🙂 Thanks for your kind words! Hey Paula, Is Charles Lane still free? May I do Patrick Magee? Absolutely, that’s a good one! Added you to the list. Oh man, I LOVE this series Paula. I always learn so much about the various characters I’m not familiar with. What a fun way to introduce films to people through its memorable characters! I look forward to seeing everyone’s posts! I’d like to take a crack at the career of character actor, Daniel Stern and his career from playing Cyril in ‘Breaking Away’ through the “Home Alone’ franchise and beyond. Sounds great, Kevin! I will add you to the list. Looking forward to it as always. Hi, Mark Strong is a great choice…I’ve been watching him for some years and he’s always reliable! I will add this to the list. Thank you! Message received! You are using a different email address so I had to go in and approve your comment, but your comments should just appear now. Disqus has a Denial of Service attack last week and things are just getting back to normal. Just wanted to make sure I could answer comments this weekend. Thw “Test. Test. Test” appears just fine. This is weird. So maybe something’s going on still. I approved both of your comments right away, which is why it appeared right away, but usually after I approve someone once, their subsequent comments show up without my having to approve them. I will keep an eye out for your comments (and everyone else’s). Got it, thanks! I’ll add it to the list. Going out of town beginning tomorrow, so I am getting this one up today. https://wolffianclassicmoviesdigest.wordpress.com/2017/12/15/eugene-pallettewhat-a-character/ i added my post today. Superb work delightfully executed. About the only notable comics of that day missing are Godfrey Cambridge (‘The President’s Analyst’, ‘Watermelon Man’ and ‘Cotton Comes To Harlem’), Jerry Stiller and Anne Meara who were movng from Stand Up to Television.